This Medique 740P25P first aid kit is packed with over 100 first aid supplies to treat any unforeseen accident in your small business or restaurant. From cuts, scrapes, and burns to ailments like headaches or back pain, this kit contains everything you need to safely and effectively bandage and treat a variety of symptoms or wounds. It is designed to serve 25 people. A durable, wall mountable plastic case is included, which measures 13 3/4"W x 9 1/4"D x 2 3/4"H.
This kit is exactly what we needed to make our health inspector happy and have a quick resource for our employees. We even hung it on the wall for ease. In a brewery, accidents can happen and a first aid kit is pretty essential for our company. There's enough items in here to take care of most scrapes/cuts although the quality of the bandaids could be a little better. Very pleased with this quite extensive first aid kit. The wall mounting option provides great functionality and means it won't take up space in your cabinets. I'm not sure what it means by "25 person" but I'm positive with the 138 pieces that are included it, it will easily serve that many people. This is a nice little kit to have around the house. It is only for 25 people but it has 138 pieces. it's nice for minor accidents. We purchased two of these to place in our store-one for the store area and one for the work room. The kit contains everything we need to be prepared for general on-the-job accidents . It was so nice to be fully equipped for injuries with just one purchase. Medique 740P25P 138 Piece First Aid Kit 25 Person --- this is a good little first aid kit and it already came in handy on the first day of business! Good price for a first aid kit. All establishments should definitively have one of these. Has holes on the handle so you can attach to the wall. Too much gauze, not enough aspirin/ibuprofin. But that is generally my opinion of kits. I got it to make the health inspector happy and he is! Great must have. I burn myself 100 times!! this kit had everything for first aid. It has saved me time when I needed it and save me from suffering my burns all day. This first aid kit has lots of medical stuff it's useful for minor injuries. It's has good handle to hang it on wall.its good quality box with clips. A great first aid kit. We keep it on hand for our staff of 6. After a year of use, the only thing we should probably replace is the aspirin as it goes the quickest. This kit is amazing! it contains everything you might need in your restaurant if something happens. You can hang it on the wall and apply the adhesive. We have this first aid kit located in the kitchen of our coffee and tea shop. It has pretty much everything we need in case of a minor accident. This first aid kit is the perfect size and has everything you will need in case of any accidents. It comes with 138 pieces. Nice! For the price point this is a great kit, and we actually used it as a refill to our larger kit in the back office, it has pretty much all you need. Nice little kit with everything you need in a typical kitchen. Hangs on the wall easily with built in screw holes. Don't open it while hanging on the all, all of the pieces will fall out. It has everything I needed to pass my food truck inspection. Had to use one on the bandages after a minor cut, it has a plastic feel to it that did get annoying after wearing a while, but worked perfectly for keeping the blood in my body where it should be. This first aid kit is perfect for small businesses or over the road truckers and numerous other smaller sized companies. Required by most states and full of what you need. This is a great little first aid kit, perfect for my small business. It contains most all of the necessary emergency first aid items, and is very affordable. We recently ordered this first aid kit for our catering kitchen and event staff as our old kit was rather picked over. This kit came with all the things you may need in a catering space. We were pleased with everything that was included in the kit (from the burn cream to the tweeters and eye solution) and plan to continue buying the individual refills from Webstaurant as the kit is used. Love this first aid kit! Perfect size. The case is pretty good quality and even has a seal to prevent against water. Comes with a good variety of items. Great starter first aid kit for a great price! To meet compliancy and just to be careful and cautious, having one of these kits is great to have on site in most establishments. This is good as either a starter kit, until you might need to replace items or upgrade to a larger kit/container depending on use and number of employees/people. Has all the basic essentials, but of course you can always add items as needed. Everything seems to be squashed in this little 10x7 box. I affixed it to the wall for ease of access and the first time I used it, everything fell out. Also made of cheap plastic, on of the lid locks snapped during shipping. Perfect size for our needs, this First Aid Kit is well equipped with all the essentials. It comes with pre-drilled holes, so it can be hung on the wall. We had originally purchased a smaller kit from a local big box retailer but our health department recommended we upgrade to this larger 138 piece kit. We haven't had to use it yet, but it's there when we do! Very Basic first aid kit. Its a good start up kit and has all the basic things you will need. However depending on what type of environment your in, your need another one or add to this one. I purchase one of these every school year for my classroom. It sure does come in handy, not only for the students, but for me as well! Pretty decent first aid kit - this has been bolted to the wall in our kitchen for easy access. Everything seems to be fully stocked and has lots of necessary items. Would recommend for any kitchen! Basic first aid kit but cover all the basic things you will need. I recommend you buy some extra bandages while having these shipped to keep as extras. Perfect little first aid kit with every thing you need in it. I have very little space and needed some thing small and this was the perfect size at a good price! having a first aid kit is a must anyway. why not buy one at the lowest price from the best restaurant sales company. this kit is small enough to store in a draw and has everything you need for a kitchen. Wow. I was so pleased to come across this kit. What an economical value this smaller first aid kit is. It has a myriad of items inside. It holds all that I was looking for and more. My restaurant is small, and I don't need a big and expensive shelf kit. This is perfect! I even got one for my boat. Thankfully we don't have to many people needing to use this kit on a regular basis, but when it's needed, it comes through in the clutch. Perfect for a smaller place. Just got this first aid kit today. I really like the size and how easy it is to carry around. It is perfect with all the supplies it has in it. Great kit for a small business. We have 15 employees and you never know when this magic box is needed. It has just about everything you need for an injury. This first aid kit is a great buy for the price. Our restaurant is small and you don't need a huge kit, but you don't want something that doesn't have everything that you need in it. This one does. I was looking for the first aid kit for my small restaurant and I found this. I am so glad I found this because I just wanted to have basic, not so expensive kit and this kit has everything I needed and price was great. This is really working good for small restaurant. I like this first aid kit. It is very small and durable and actually has a lot of stuff inside of the kit including eye wash. I think every restaurant should order it. Very average first aid kit, with a few basics for almost anything. The box is the cool part, instead of those zipper bags that rip. Could use better grade band aids though. Great price and great quality. We use this in our drink trailer and it's compact enough to not take up valuable space, yet has enough supplies for any occasion! This kit has all the essentials for an emergency cut or scrape. It has enough in it for a few accidents. We have under 20 employees so this is the perfect size for us. This first aid kit comes with a box and a sticker. You get to attach that "First Aid" sticker wherever you wish to put it on. The box is light and easy to store. Good price for a good quality product. It's always a good idea when you have people working with knives to be prepared for the worst. This is a great item to keep in the kitchen! This may seem like a small first aid kit but it sure does hold a lot. The only thing I had to buy extra of were band aids. Only has aspirin and no ibuprofen, ibuprofen is better to reduce muscle inflammation that sometimes occurs from working long hours. Good for the price, but still needed to buy some things separate. This kit has everything! This was a great kit for our salon as occasionally stylists suffer burns and cuts (though thankfully not frequently!). This kit has everything we needed for such incidents and comes in a very distinctive white box, very reminiscent of a med kit from a video game. The handle on the box allows for easy carrying or for being easily hung on the wall for direct access. The first aid decal is a separate sticker that comes with the kit so if you wished to use the white box for storage after the sticker can be peeled off at that time. This first aid kit contains everything that you would ever need. We have already used it a few times in just a couple weeks. Very nice to have close by! Great product at a great price, this kit has everything that you could think of and it works great for a normal sized restaurant, last a long time!!! This first aid kit is a super buy for the price. Our cafe is small and you don't need a huge kit, but you don't want something that doesn't have everything that you need in it. This one does. Best price available for a small restaurant, for sure. What can I say, it is a first aid kit. It is a perfect size for our business. Only a few employees, so we should be good with this one. Strong case and all the products look good. Good product and does what it needs. Has enough stuff in it that I would feel prepared in most types of injuries. Good to have around. Very nice first aid kit!! There are so many useful items inside. I was happy with what I got, any where else this would have cost me a lot more. If you are looking for a decent priced well stocked kit look at this one, only thing I also recommend is burn crème as another item to put into it. Great product, great price. Perfect for my small business that vends at Farmers Markets. Small and compact, but complete. Great piece of mind to have on hand for my employees. It is just what I was looking for. Great product overall. The ice pack was busted when it arrived to us, but overall, it has everything in it that you need for a restaurant. Thank you for reviewing this product! Customer service will be in contact to provide assistance. I buy these first aid kits which are required for a retail business. Inexpensive, compact, everything you need to patch up an light injury. I highly recommend. No one can beat this price! I can't believe how many pieces come in this kit. Its a must have at your business as well as at home. We ended up purchasing two of these per the Health Dept. and they're perfect - small, contain enough quantity of the items you actually use (bandaids, aspirin), and good price. This First Aid Kit was easy to mount in a high traffic, easy to reach, very visible area. Perfect for emergencies or not-so-emergencies with what we need and where we need it. This is a good first aid kit to have anywhere.It has anything you need. great for camping, boating, and at home or work. Good Price. This First aid kit is small in size but large in quantity!! It has all the necessities for any minor injury in the kitchen!! A must have item!!! The First Aid Kit 25 Person Medique 141 Pcs. It is great everyone needs a first ad kit, Weither it is for home or a business. You never know when one is needed. Everything included is a nessity. The First Aid Kit 25 Person edique 141 pcs. It is great everyone needs a first aid kit weither at home or a business. I know with kid someone is always getting hurt. Everythinh you need for basic first aid is in this kit. Good price and you need to have one of these in the facility. I looked around at a few places, and this kit is reasonably priced and complete. Not so keen on this product. Reasonable price, but filled with lots of little junkies that I can't imagine we will use. Time will tell though. Thisfirst aid kit has everything you need for the backroom or breakroom! The burn gel works wonders, thankfully I have only had to use it once. The kit is fully stocked with all first aid supplies. 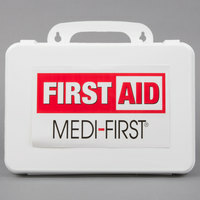 Every Business need's to have a First Aid Kit.The medique has 141 pcs. Everything you need to get started with until you can get professional help if needed.We have several,at our business and home,Even one in our Rv comes in very handy. I was actually dubious about this item, but bought it any way because it was such an unbeatable price. I was pleasantly surprised - it includes everything you need and saves space. This is an excellent first aid kit. I have it in my home. Everything you could possibly need is included in this kit. And its perfectly priced. This first aid kit was just the right size to travel with for my daughter's college lacrosse team at their matches. It has all the items we might need for accidents. realy good it is , , compact , small ,space saver. we had quiet few use for it , every thing you need in one box. The kit really does what it is supposed to do, with all the necessary supplies for our 15-person staff at the bakery. If anything, it would be nice with more band-aids. My office had one of this kit bought from webstaurant. The price is unbeatable, every other local stores would cost twice to buy one of this kit. The kit is perfect for small working group has less than 25 employees. Had one like this hanging right in my kitchen, very convenient. Just perfect for a small restaurant has less than 25 workers and very budget friendly. Every small restaurant needs this 1st aid kit, comes with everything you need for immediate emergency use. Small enough to store easily in a lightweight durable plastic container.